As a child I had a hard time knowing the God that everyone kept referring to: the omniscient deity who I was to welcome into my heart, but who I felt was wholly separate from me and this entire earthly experience. While I knew intuitively that there is something greater than that which we see in front of us, I didn’t see a concept of God that fit my experience. A less traditional view is that God is another word for All That Is. The idea is that God, of infinite energy and capacity knew of her ability to do, be, or have anything she desired. However, the knowing was not enough without the experience of it. God yearned to experience being God. Thus the world of relativity was created, where All That Is has been superficially divided into this and that – and the space in between – all with the same ultimate source. This piece came about without much of a plan, but the ultimate composition reminds me of this concept. 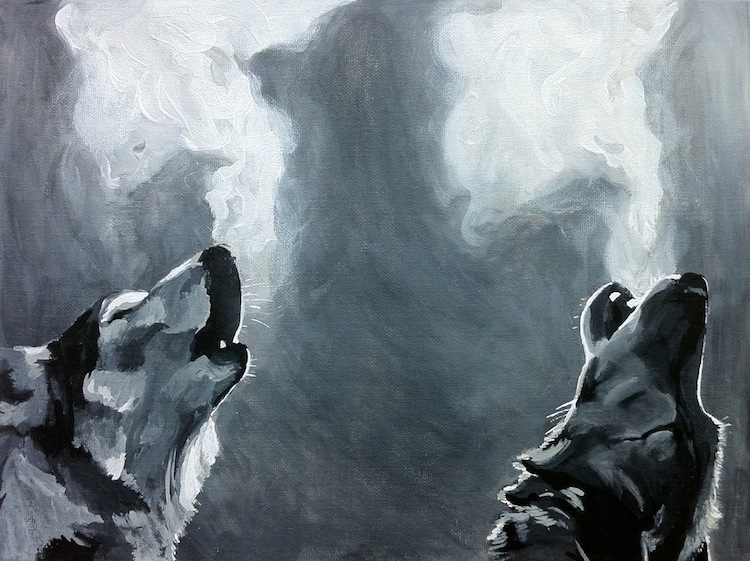 The two individuals, separated by a visually vast space, are pack mates, harmonizing into the same early morning. The natural world, full of its complex ecosystems and numerous symbiotic relationships, exhibits wonderfully the interrelatedness of all of its parts and the resulting adventures that cannot be truly understood until experienced. Whether it is a path through nature, religion, or another realm entirely, may your journey be lovely!